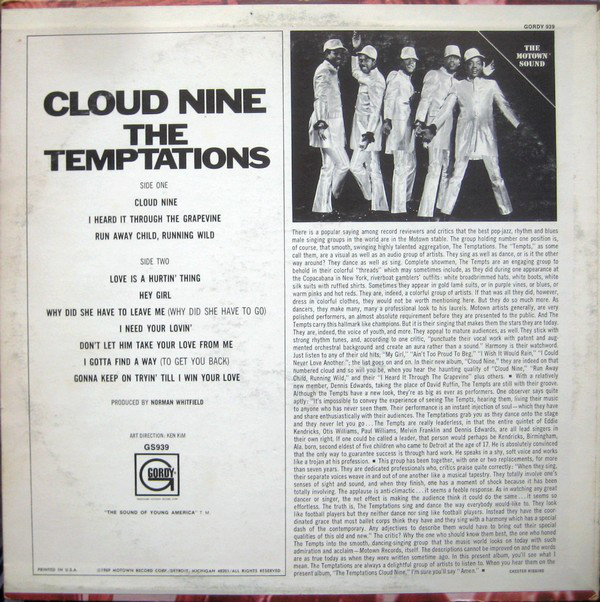 This was the album that really changed things for The Temptations, and considerably changed the face and sound of Motown. David Ruffin had left, acrimoniously, replaced by Dennis Edwards and Norman Whitfield had taken over as producer. And how. He swept clean the decks and developed as funky, psychedelic, punchy, socially conscious maelstrom of a sound that single-handedly launched the genre of "psychedelic soul". Apart from Sly & The Family Stone and the odd murmuring from Stevie Wonder, there were no soul artists out the expressing social, racial and cultural awareness until now. The Temptations were truly ground-breaking in that respect, along with Whitfield's visionary production, of course. The stereo sound on this album is revelatory. Wonderful to experience, just turn it up and revel in its sonic glory. The title track is a superb, muscular opener with an outstanding deep, bassy stereo sound that just blasts out of your speakers, while their jazzy cover of Marvin Gaye's "I Heard It Through The Grapevine" had a funky appeal, despite the "default" status of Gaye's version. "Runaway Child Running Wild" is over eight minutes of hard-hitting social comment, full of buzzsaw guitars, titanic drums, convincing vocals, sumptuous percussion and one hell of a message regarding urban living. The bit where the child cries over the insistent, funk backing is chilling. This was the original "side one" - three remarkable cuts that made people sit up and take notice of the changing musical times. 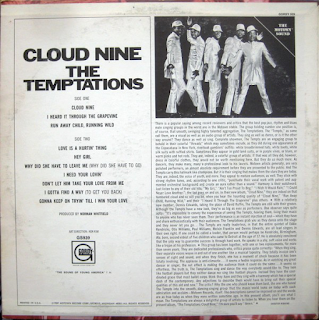 The old "side two" was more typical Temptations Motown soul fare. Seven short sharp, melodic love songs, none of which exceeded three minutes. They are all immaculately sung, and vocals dominate funk far more than on "side one". The rhythms are orchestrated and not in the least "psychedelic" and bit like the way Four Tops albums had a killer side one and a side two made up of "easy listening" cover versions, this album doesn't knit together as one whole. It is almost like two albums. 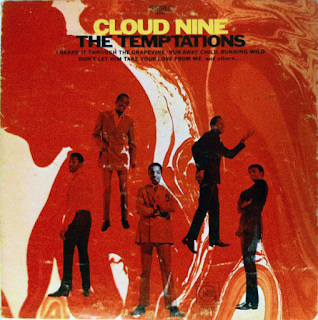 You have to say, though, that "Why Did She Have To Leave Me (Why Did She Have To Go)" with Edwards supplying a sublime lead vocal is The Temptations at their most beautifully soulful. Similarly, Eddie Kendricks' falsetto vocal on "I Need Your Lovin'" is outstanding. Paul Williams gives a great lead vocal on "Don't Let Him Take Your Love From Me" and "I Gotta Find A Way To Get You Back" has such a Northern Soul beat to it. This side was certainly not a bad side in any way, in fact it a great soul side of music, it just was quite different to the blistering funk of side one. "Gonna Keep On Tryin' Till I Win Your Love" has a great bass line and "Hey Girl" and the cover of Lou Rawls' "Love is A Hurtin' Thing" are all enjoyable.